This is the second of this year’s recipe trilogy in honor of Saint Patrick’s day. Guinness got just about everything right with their traditional stout, but one thing my father never told me as he slowly sipped it from an ice cold mug, is that it could be so much more than just a relaxing night cap. Last year we introduced you to our Guinness beef stew. This year we built on that idea and decided to put it in possibly the best dinner pie of all time. Steak and Guinness Pie is rich, it’s hearty, and embraces one of the tastiest Irish dinners of all time. 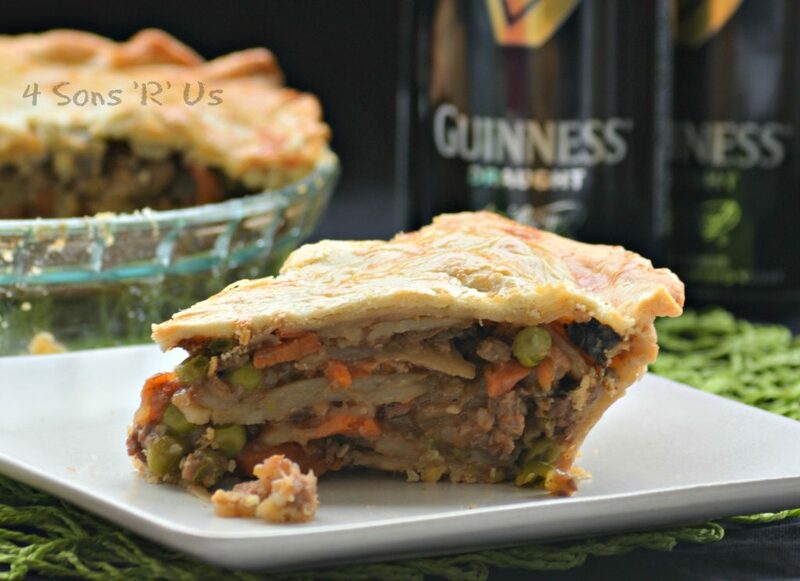 Merging a beef pot pie with the tenderizing and fortifying flavors of Guinness stout is pure genius. Fast forward 20 years, and you’ve got my kids who don’t see me sipping on an ice cold brew so much as putting it in their food. And then they freak out, like they’re doing something naughty by consuming a dish with ‘alcohol’ in it. And I’m over here like, ‘Little people, do you really think I would serve you something bad for you, let alone illegal?’ They still don’t believe me that the intoxicating bit all cooks off long before it’s served to them, but I continue to assure them that it does and thus all dishes consumed in our kitchen are harmless and well within the limits of the law. Personally, I think they just like to talk about it because their friends think they’re cool or something. Silly boys, but kids will be kids, or so they say. Cooked off alcohol aside, this pie combines two thing’s Ireland’s famous for, their beef and their beer although ours does have a decidedly American bent. It’s all brought together in a convenient dish that’s as rustic looking as it is good. All the hearty beef stew flavors you’re familiar with, but enriched with the deep Guinness flavor that also tenderizes the meat until it melts in your mouth. 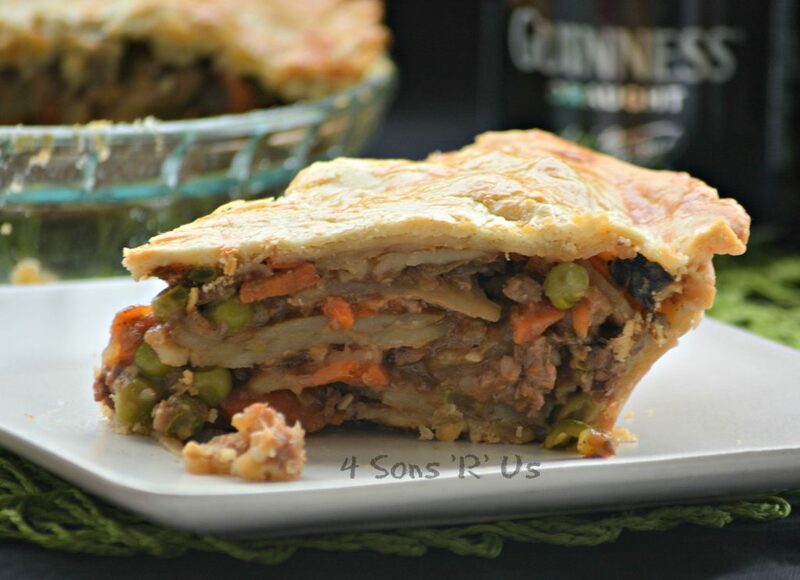 Loaded with ‘peasant’ vegetables, chunks of tender beef, and a savory sauce all tucked between two layers of golden, flaky pie crust– it is perfection. The hearty and delicious flavors you love about a great beef stew (with a distinctive hint of Guinness) tucked in between two layers of golden, flaky pie crust pastry. Generously season the beef with salt and pepper. Add the oil into a Dutch oven over medium heat. Add in the seasoned beef and brown on all sides before removing it with a slotted spoon and letting it rest on a paper towel lined plate to drain. Add the onions to the pot and sautee for a couple of minutes, or until they're soft and translucent. Add in the celery and mushrooms to the pot and sautee them for a couple of minutes. Next, add in the tomato paste, thyme and rosemary and stir to evenly disperse. Stir the beef back into the pot along with the stout and the broth. Bring the stew to a rolling boil. Stir in the brown sugar and add a bay leaf to the stew, then turn the heat down to a low simmer. Cover the pot and let the stew simmer for about 30 minutes. Stir in the potatoes, return the cover and let the stew continue to simmer for another 30 minutes or so. After making sure the potatoes are fork tender, bring the stew to a rapid boil, and then stir in the flour slurry until evenly incorporated. The stew will start to thicken right away, and once it's reached the consistency you like, turn the heat off and add the frozen peas and carrots. Roll out the first pie crust. Lay it evenly in the bottom of a 9" pie pan. Gently press the sides into the glass so it rests flat against the dish. Prick the bottom several times with a fork. Ladle the stew into the pie pan until it's even or just above the top of the dish, and then carefully lay the other pie crust out over top. Pinch the two crusts together along the rim of the dish to seal. Brush the top of the pie lightly with egg wash and use a sharp knife to cut 2-3 slits in the top. Bake the pot pie in the oven at 400 degrees for 20-25 minutes and until the crust has turned golden and crispy. Remove the pie from the oven and allow it rest for 5-10 minutes before slicing and serving. If you have leftover stew after filling your pie, eat it as is or you can save it to make into a smaller pot pie. It also freezes well. That’s funny that they make such a big deal over beer in their food. I am sure my day is coming 😉 This looks absolutely amazing! I haven’t made a pot pie in a few months, I need to remedy that soon! Wow, this is one mile high pie that looks and sounds amazing! Meaghan, this looks insanely good! Perfect for St. PAt’s! Meghan that is my kind of serious pie. Pinned! Thanks, Quinn & so glad you liked it.